Win tickets to the 105th Clovis Rodeo! 93.7 Kiss Country is counting down the days until the 105th Clovis Rodeo! 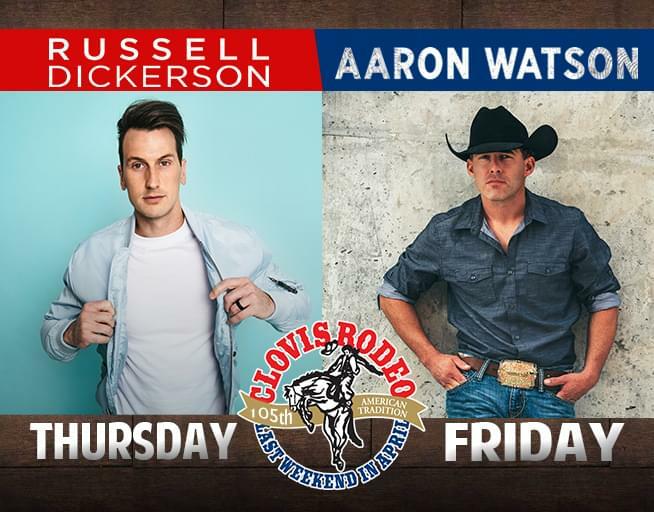 Listen to win tickets to see Russell Dickerson April 25th and Aaron Watson April 26th at the 105th annual Clovis Rodeo. Tickets are on sale now but you can win them now. Starting Monday April 15th listen through out the day for your chance to win tickets to both concerts at the Clovis Rodeo. Start your morning off with Gnarley Charley and Jody Jo, Erica Pierce in Middays and Carp in the Afternoon for your chance to win. When you hear the cue to call, pick up the phone and call the 93.7 Kiss Country Studios at 1.800.767.KISS (5477) and you could pick up tickets to see Russell Dickerson and Aaron Watson. One of the top rodeos in America and one of the oldest, the 105th Clovis Rodeo will take place April 25-28, 2019. Located in California’s Central Valley, the rodeo is a celebration of the community’s western heritage. The Clovis Rodeo has grown into one of the top two rodeos in California and top ten across the nation. Making its debut in 2017 as one of only nine PRCA Gold Tour Rodeos in California, it is responsible for bringing some of the sport’s world champions and top cowboys to the state. The Clovis Rodeo opens on Thursday, April 25 with the return of the PBR Bull Riding Touring Pro-Division and some of the rankest bulls and toughest up and coming cowboys in bull riding. Three days of PRCA Gold Tour Rodeo action will follow along with the popular Clovis Rodeo parade on Saturday, April 27. Watch for great local talent performing daily on the Coors Light Stage prior to each rodeo performance with your paid admission. Coors Light Stage artists/times subject to change. Tickets are on sale now! Tickets and information are available online at ClovisRodeo.com or at the Clovis Rodeo Box Office. See Box Office hours below. Tickets are available at any time on at ClovisRodeo.com.